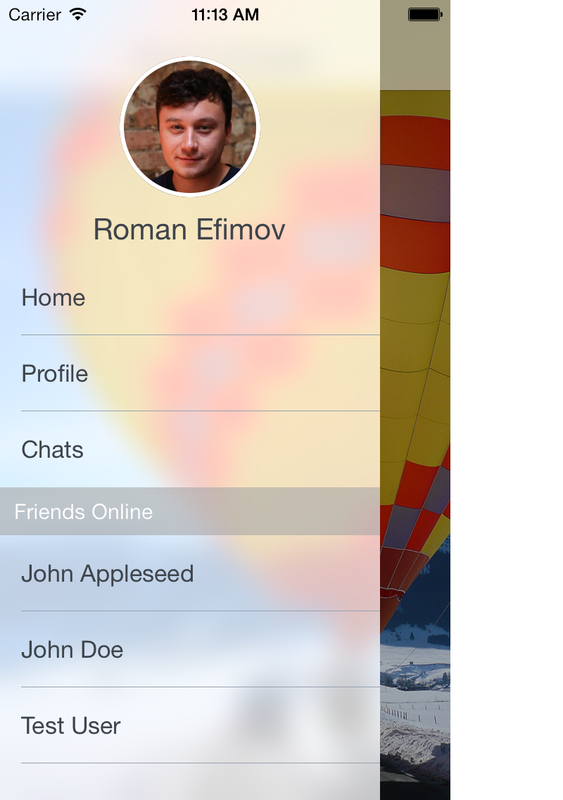 iOS 7/8 style blurred view controller that appears on top of your view controller. Build and run the REFrostedViewControllerExample project in Xcode to see REFrostedViewController in action. The recommended approach for installating REFrostedViewController is via the CocoaPods package manager, as it provides flexible dependency management and dead simple installation. For best results, it is recommended that you install via CocoaPods >= 0.28.0 using Git >= 1.8.0 installed via Homebrew. All you need to do is drop REFrostedViewController files into your project, and add #include "REFrostedViewController.h" to the top of classes that will use it. Your project must be linked against the Accelerate framework. In your AppDelegate’s - (BOOL)application:(UIApplication *)application didFinishLaunchingWithOptions:(NSDictionary *)launchOptions create the view controller and assign content and menu view controllers. By default, live blurring is enabled under iOS 7. The live blurring is performed by using a UIToolbar as a background view, that means when you change its tint color, it becomes desaturated. That’s the way it works on iOS 7. iPhone 4 doesn’t support live blur and falls back to a transparent view. This also applies to when a user device has high contrast accessibility setting set to on. To disable live blurring, set liveBlur property to NO. 1.Create a subclass of REFrostedViewController. In this example we call it DEMORootViewController. 2.In the Storyboard designate the root view’s owner as DEMORootViewController. 3.Make sure to #import "REFrostedViewController.h" in DEMORootViewController.h. 4.Add more view controllers to your Storyboard, and give them identifiers “menuController” and “contentController”. Note that in the new XCode the identifier is called “Storyboard ID” and can be found in the Identity inspector. Inspired by a Dribbble shot, author Jackie Tran. The blur algorithm that is used for static blur comes from WWDC 2013’s session 208, “What’s New in iOS User Interface Design”. REFrostedViewController is available under the MIT license. Copyright © 2013 Roman Efimov.